Pan Products Ltd was registered in July 1999, initially to manage the patented Paving Anchor which was developed by Mark Panton, Director/Designer. Mark continued developing innovative new products. 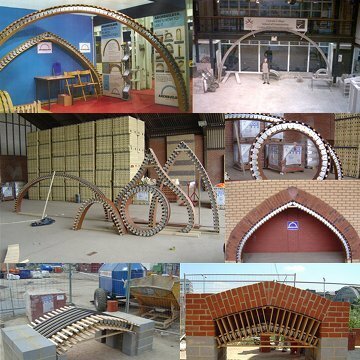 The Arch Builder was in development from 2004 until 2006, a chain of any length which can be set into any shaped arch to provide support for the construction of brick arches. This has been used in the development at St Pancras Eurostar Railway Project, to provide complex cantilever arch support for the construction of the exterior façade of the building, and also in the bowels of the station where arched alcoves opened through to the new extension. Arch Builder chains could be formed into various arch designs as shown in the photo to the right. When the Arch Builder was used at Lincoln Technical College to construct a semi-circular arch with an 8.5m span and height of 4.25m, we realized we were underestimating the potential of the arch technology. 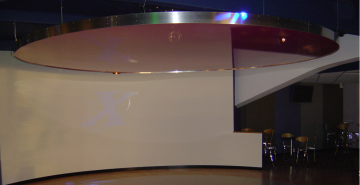 Worcester Bowl Xtreme Key Curve was developed in 2004 for the stretch ceiling industry; the photos to the right show a 5m disc being constructed above the dance floor. Pan Products Ltd was the only company in the UK who could construct a spoke-less ring that would withstand the internal force of the stretch fabric at 50kg per 300mm. This was necessary as the spokes would have ruined the light-shows generated through small holes in the fabric. Late 2004, days after the Asian Tsunami, we quickly jumped to the idea of constructing an emergency shelter. From this idea, we began to realize this invention could be used to construct complete buildings, not just to the form openings within them. The first Arch House prototype was born in 2005. The 3.5m wide, 3.2m high building is still being used today and although the untreated cladding has aged, our patented Tension Arches that support the structure remain in perfect condition. The second Arch House, a complete product, was constructed in 2008. This is a larger model which is fully insulated, with double glazing, skylight and electricity. This Arch House is still used today as our visitor display model and has day to day use as a summerhouse and studio, and since being built, has had not required any maintenance, or restoration work. For more information on the Arch House visit Alfresco Arch. 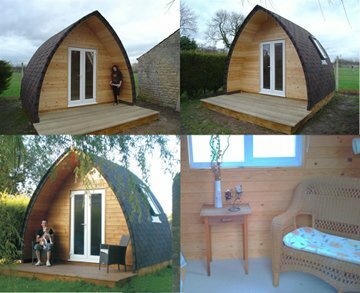 Since the development of the Arch House, several projects have further developed the ideas and uses for the Patented Tension Arches, including impressive Tree House projects. The Horse Arc was developed in co-operation with Equine Scientists and the National Trust in 2011 and has been gradually improved by offering optional extras over the last year.